This is an enlightening book, filled with fascinating characters and details. I know a lot about Nazi Germany, but the fact that there was a boom in sales of blonde hair dye after 1933 was new to me, as was Julius Streicher’s belief that Queen Victoria had elevated Benjamin Disraeli to the title of Lord Gladstone. I could provide more examples, but you will find them if you read the book. Some foreign visitors were entranced by Hitler. Some weren’t sure what to think. Some enjoyed traveling through what seemed a happy and thriving country. Others saw through Hitler and realized clearly what Nazism meant. The book is based on the published accounts of many people, but also on solid archival research. 5,0 van 5 sterrenA scholarly, historical page-turner! This is a captivating book, one that I couldn't put down, reading first-hand accounts of intellectuals, tourists, Chinese scholars, athletes and more as they traveled in the early 1930s, before the worm turned. Highly recommended! Eye opening to read about this period leading up to the war. So hard to fathom how it all happened. This was such an interesting read. It describes life in Germany from the end of WW1 right through into WW2 as seen through the eyes of those visiting the country, from diplomats and aristocracy to ordinary people. Much has been written about WW2 and the politics leading up to it. This book covers a longer period and is more a social history, and on a more human scale. 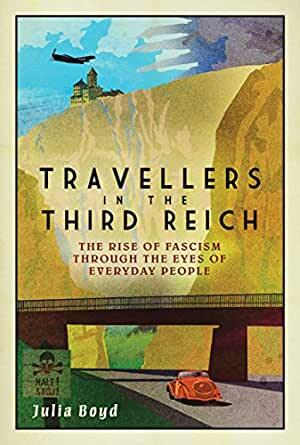 Julia Boyd's historical account of travelers, mostly British and American, to Germany between the two World Wars is a thrilling, beautifully written page-turner. The detail is astonishing, the prose is limpid, and the effect is overwhelming. I do not tend to read history books but found this 500-page volume amazing. FIVE STARS without discussion.